Last month we’ve written about the Crowdfunding Campaign for ccMiner fork With NeoScrypt Support and the miner is already being made available for people that have donated to the developer djm34. 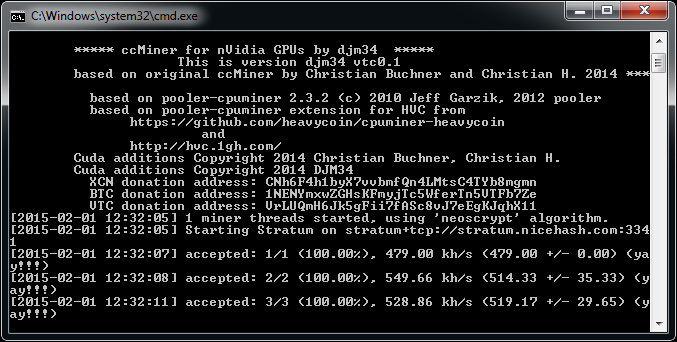 We have already played a bit with the latest version of the ccMiner fork with NeoScrypt algorithm support and have tested it on multiple Nvidia-based video cards. 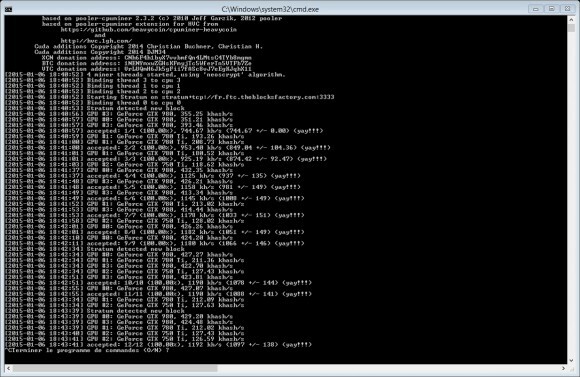 Although we have tested the miner on Maxwell-based GPUs (Compute 5.x) only the size of the compiled Windows binary suggests that the miner is also compiled for Compute 3.x cards, so it should work on older video cards as well, though the performance may not be that good. Do note that the ccMiner fork with NeoScrypt support apparently does not currently have support for extranonce that is being used by services such as NiceHash and WestHash. We have used GTX 980, GTX 960 and GTX 750 Ti for our tests and the results you can find below are achieved with the latest video drivers that were released along with the GeForce GTX 960 video cards. We are seeing a considerable increase in performance when we compare it to the initial performance results that were shared by djm34 when he initially announced the crowdfunding of the project early last month. So the development of the miner hasn’t stopped and you can show your support by donating to the project to keep the developer motivated and to reach the goal of making it public for everyone. There are some important notes regarding the parameter throughput that is used by the miner, it seems that for us value of 1 works best for GTX 980 and GTX 960 bringing a more consistent and high performance. The performance of the GTX 980 is not affected much by the throughput option, so it works without it pretty well, but the GTX without the extra option provides just about 50-60 KHS. For GTX 750 Ti there seems to be not much of a difference what setting we use or throughput in regards to the hashrate we are getting, although a value of 1 does seem to also provide a more consistent hashrate, but your results may vary. Do note that the results posted above are from a reference GTX 750 Ti and GTX 980 video cards that are running at their stock frequencies while the GTX 960 GPU is a factory overclocked ASUS Strix GTX 960. This clarification is important when you take into account the hashrate that the GTX 960 has as compared to the GTX 750 Ti – double, and more that 50% that of the GTX 980 card. It seems that djm34, has been working on adding NeoScrypt algorithm support to ccMiner and he apparently already has a well performing work in progress fork of ccMiner. The Nvidia GPUs ccMiner fork with NeoScrypt support however is going to be made public if there is enough user interest and the crowdfunding reaches the total sum of 5 BTC in the form of donations going to the author. If the crowdfunding goal is not reached the miner might be made available only to the people that have donated. 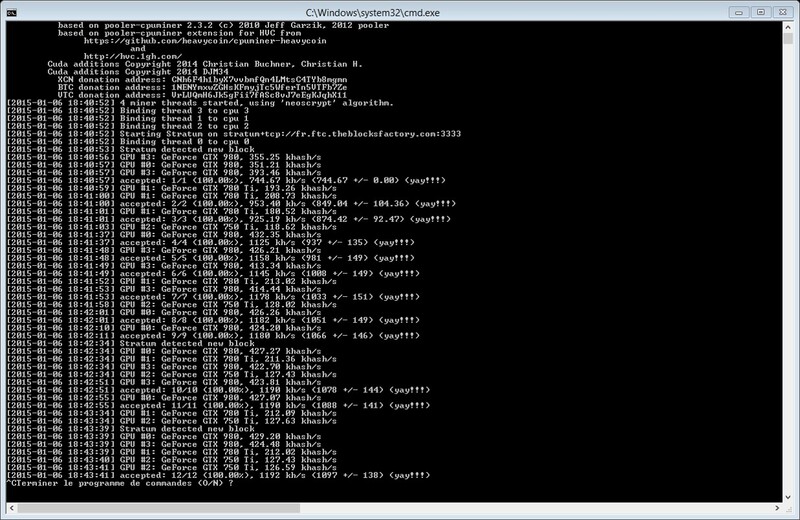 Also further improvements in the hashrate are probably possible, so the miner might get even faster over time. If you are interested in mining NeoScrypt-based crypto coins and this goes not only for Feathercoin (FTC), but a few more NeoScrypt altcoins and are using Nvidia GPU mining rigs you are more than welcome to support the project.